If the front of your historic commercial building is covered with prefabricated metal panels, those panels may be concealing a wonderful, intact historic facade. This prefabricated metal front is commonly referred to as a slipcover. Slipcovers were introduced in the mid-20th century. Building owners applied these slipcovers to their older historic buildings in an effort to refresh their business and create a more modern appearance. You can restore the historic appearance of your building by removing these metal panels. Slipcovers were applied to many downtown Wisconsin buildings in the decades after World War II, particularly from the 1950s to the 1970s. Slipcovers were most often made of aluminum or sheet metal. The panels were manufactured in industrial plants, shipped to the site and erected over the existing facade. Aluminum companies such as Alcoa (Aluminum Company of America) began to produce and promote these large panels as a means to cover the entire front of a building. Often multiple business owners in the same area would cover their historic building fronts to create a noticeable “modernization” of the downtown streetscape. 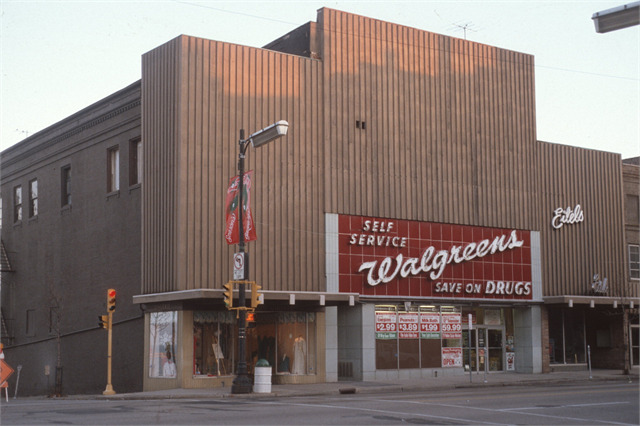 As a result, slipcovers changed the face of many downtown areas. When a slipcover was applied to a building, a framework was built and anchored into the face of the original building. The interlocking metal panels were applied to the framework. Sometimes the original building details were removed or damaged when a slipcover was applied to a building, but most historic facades remained relatively intact underneath the added metal panels. 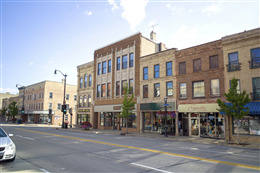 In recent times, many downtown building owners have come to believe that slipcovers did not improve their business and contributed to the loss of their downtown’s unique character. Many building owners have removed these slipcovers and restored their original building exterior. If your historic commercial building was altered with a slipcover from the mid- to late-20th century, there is a good chance that your building’s original features are intact. You can do some investigation to determine if your original facade remains. Look through an upstairs window, and if there is enough space between your original building and the added materials, you might be able to see your original facade. You can also remove a small panel to view the condition of your building underneath. If your building appears to be intact beneath the metal facade, you can remove the added facade to expose your original building facade. Since most slipcovers are made of aluminum or steel, you can sell or recycle them. You may want to consult with the Resource Evaluation Committee at the Wisconsin Historical Society to help determine if the added materials have gained their own historical or architectural distinction. If not, you are encouraged to remove the slipcover and restore the original appearance of your building. You may find that some of the original features of your building were damaged when the slipcover panels were added. This damage could include holes where mounting bolts were attached to the building, removal of decorative wood, brick or terra cotta features, rust stains or staining due to bird nests. If your building has such damage, use preservation best practices to repair and restore your building.